Oregon became the 33d state in the Union on February 14, 1859. Portland had wooden sidewalks, and gold glittered in southern Oregon streams. Towns like Lookingglass, Needy, and Sodaville were springing up all around. It is a time to remember—and to revisit—today, 150 years later, with this detailed and lively guide. 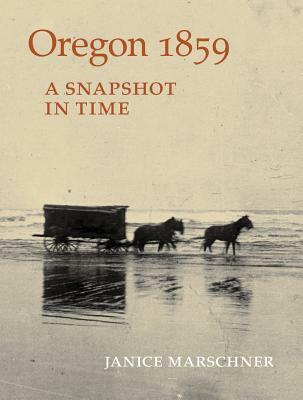 Janice Marschner provides all you need to travel through each of Oregon's 19 original counties at the moment of statehood: a map showing each county's 1859 place names and current reference points; the history of native peoples and settlers; early roads and bridges; the first homes, schools, stores, hotels, and churches; biographical sketches of notable individuals throughout the state; lists of family names from Applegate and Lovejoy to McLoughlin, Reed, and Zumwalt; and sites to see. Historical photographs show the determined faces of natives and settlers; their oxen and wagons on wide, rough roads; their rafts and ferries on the rivers; and their towns under development. This book is only available through print on demand. All interior art is black and white. Janice Marschner was born and raised in the San Francisco Bay area and has lived in Sacramento since 1973. Her parents grew up in Eugene, Oregon, and Marschner spent many summers visiting family in the Eugene and Portland areas. Before retiring early to pursue her interest in history, she worked for a state senator and as a legislative analyst for the State of California. Her first book, California 1850: A Snapshot in Time, commemorated California's sesquicentennial in 2000.